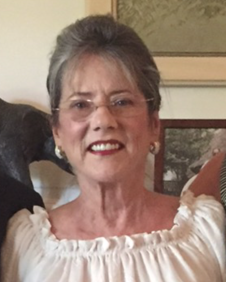 Christine Russ Butler, 72, passed away on Sunday, February 3, 2019 in the comfort of her home surrounded by her family. Christine is survived by her husband, Richard E. Butler, II, her two daughters, Quita Wittenbach and Tina Buford and their husbands, Troy Wittenbach and Trey Buford; her four grandsons, Francisco and William Buford, and McLean and Gage Wittenbach; and sister, Virginia Fair Russ. She was preceded in death by her parents, Helen and Leon Russ. Memorial services for Christine will be held at St. Alban’s Episcopal Church in Harlingen, 11:00 A.M., Thursday, February 7, 2019 with Bishop David Reed officiating. Burial services will be private. Serving as Pallbearers will be Trey Buford, Troy Wittenbach, Danny Y. Butler, Johnny Clay Johnson, Clay Parker, and Dale Martin. Honorary Pallbearers will be Ann Dunkin, Frank Boggus, Kathy Yarbrough, Ann Phillips, Kathy Parker, Peggy Martin, Linda Peacock, and Stormy Stone. A reception will follow the services at the family residence in Harlingen. Those desiring to do so may make memorial donations to St. Alban’s Episcopal Church, Art Fund, 1417 E. Austin, Harlingen, TX 78550. Christine will be most remembered for her passion for art, travel and the love she had for her family.